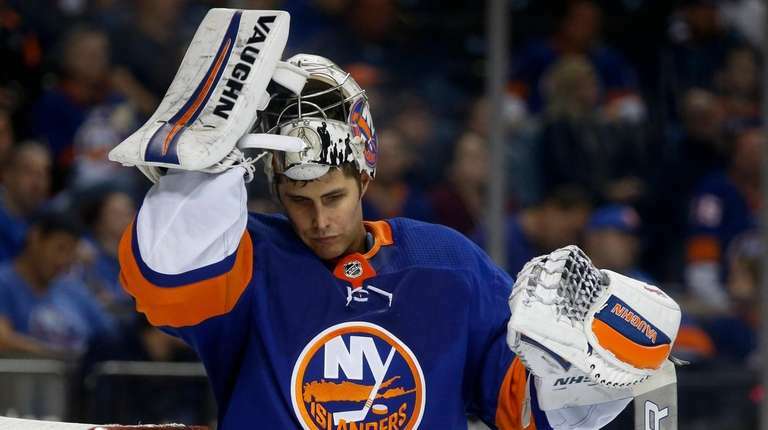 It was never a good idea to move out of Nassau Coliseum, and empty seats on Saturday night made the point. There was some stirring hockey and an enthused reception during the home opener at Barclays Center. Let’s hope we never witness anything like it again. Everybody who has a say-so should ensure that the Islanders never begin another season in Brooklyn. Entire sections of empty seats behind the Honda, still preposterously parallel-parked just beyond the goal line, symbolized why the start of this season should mark the beginning of the end of the Islanders’ stay in Brooklyn. Amend the contract. Change the percentage of games scheduled to be played on Atlantic Avenue from half to zero. It is what the players want, what the fans desperately want and even what Barclays Center executives want. Admit that this was a huge mistake — with one possible bright side (more on that in a minute) — and send the team home to Long Island, full-time and forever. As it was on Saturday night, there was energy in the stands and electricity on the ice. “Home openers are always exciting. People are excited that hockey is back. We’re excited that hockey is back,” said Matt Martin, who received arguably the loudest cheer during introductions. The odd part was, he said that after the morning skate at the beautiful practice facility at Eisenhower Park, a three- or four-minute drive to the Coliseum. Lee, his teammates, coaches and staff all had to trek into Brooklyn after that for the game against the Predators (a 4-3 loss to Nashville). Fact is, though, many fans never have gotten used to it, or got sick of it. Empty sections on a night that merited a full house tell you that. Your instincts tell you to think of what might have been had the Islanders never moved to Brooklyn in the first place. Maybe Frans Nielsen would not have immediately bolted, as if he had a Honda double-parked in Flatbush, the second he had the chance to leave. Maybe John Tavares would have re-signed before becoming a free agent and continued dreaming about raising the Stanley Cup on Long Island. Maybe we never would have heard about his Maple Leafs pajamas. To be fair, maybe it was good in a way that the Islanders did temporarily move. Without the sweetheart deal that Barclays Center offered, perhaps Scott Malkin and associates would not have considered the Islanders worth buying. An industry source said Malkin found a New York City address intriguing (adding that Belmont Park, on the Queens border, is close enough). So without the exile into one of the city boroughs, maybe Charles Wang still would own the team and still would have the same modest budget and the same general manager. That said, enough is enough. Enough of the limited-view seats. Enough of shivering on the railroad platform in Jamaica, enough of the off-center scoreboard, enough of the sketchy ice. Here is a plea that it all changes by next season. Here is a reminder that the true home opener will be Dec. 1, at the intersection of Hempstead Turnpike and Meadowbrook Parkway, on Long Island.